Changing a document's name. How to delete and move files. Deleting and moving files must be done through your cloud storage provider. You can't do this through the Document picker. So you will need to open your cloud file store - whether that's Dropbox, Google drive, One drive etc and do your moving, deleting and renaming from there. Another way you might rename a file is when you make a copy - you can simply click on Documents > Make a copy > Same Tab/New tab and save the file in a new location with a new filename. 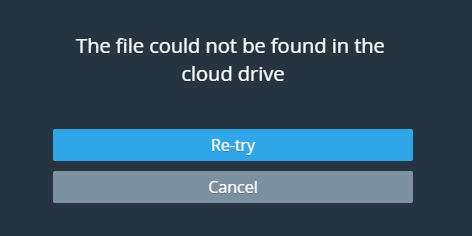 If you delete a file it will still appear in the Recent Files panel of the Document picker but you will not be able to open it - you'll receive a warning that the file couldn't be found in the cloud drive. If you tap Re-try or Cancel the picker will refresh and the deleted doc will no longer be visible.